Synopsis: One night fifteen-year-old Lina, her mother and young brother are hauled from their home by Soviet guards, thrown into cattle cars and sent away. They are being deported to Siberia.An unimaginable and harrowing journey has begun. Lina doesn’t know if she’ll ever see her father or her friends again. But she refuses to give up hope.Lina hopes for her family. For her country For her future. For love - first love, with the boy she barely knows but knows she does not want to lose . . .Will hope keep Lina alive? Set in 1941, Between Shades of Gray is an extraordinary and haunting story based on first-hand family accounts and memories from survivors. 1941. Lina has applied for a prestigious summer art program in Lithuania. She is waiting for her acceptance or her rejection, but that is no longer important. In a single night, her life turns 180 degrees. The doors of her house crash down. Her mother’s expensive pottery is smashed. She is taken, deported. They travel by train through Russia. Animal class. There are no beds, no seats, no toilets. Bodies litter the floor, hoping to survive. There is a single hole piercing the carriage floor. This will be the toilet for the next 6 weeks. Water and porridge arrives once a day in buckets. Lina and her family must survive. They must stay together and endure the horrors inflicted upon them. Most people, at the mention of the 1940s, will think of World War One, of Hitler and his concentration camps, where millions of Jews were mindlessly slaughtered. Between Shades of Gray tells the relatively untold story of Stalin and his regime. His pact with Hitler allowed him to take over several eastern-European countries, including Lithuania. During the early 1940s, Stalin began purging his newly-expanded Soviet Union of anyone who was considered ant-soviet. Doctors, lawyers, teachers, musicians and military leaders were a few who were considered such. The chances are you probably didn’t know that, and I don’t blame you – I was only recently vaguely aware of such occurrences. Ruta Sepetys’ attempt at telling the world what happened is a magnificent and hopefully successful one. Stalin’s purges may have been overshadowed by Hitler’s actions, but they were no less horrific. As you have probably realised by now, Between Shades of Gray is a grueling read. There are pages where it is hard not to flinch at the shocking conditions to which the deportees are exposed to. And yet, the cover tells a story of hope. Amongst the snow the sun is bright, and a single seedling sprouts out of the blank snow. The expectation of hope and the perseverance of love is what drives this book on. Horrible things are described. Inhumane conditions are portrayed with uncanny realism, and were it not for the love of the characters and their passion for life, I do not think I could have read much of Between Shades of Gray. At times it is just too shocking, too horrific. I should say now that this book will make you cry. I teared up quite heavily towards the end, when one of the final blows of terror had been struck. The memorable characters may be fictional (though you would hardly know it), but the situations they go through are not. You will love the characters as you love your family, because you will have experienced such horrors ‘with’ them. Every loss will be a blow, every kiss, every hug will make you soar. You will weep with them, and you will feel their anguish. 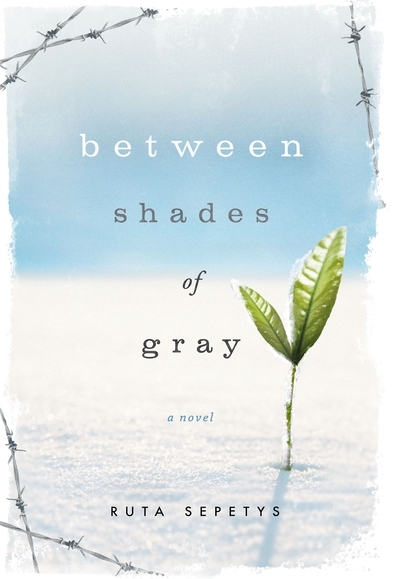 Between Shades of Gray is a harrowing, yet hopeful novel. Love and deepest affection have never been so overflowing and powerful, and Sepetys’ flowing, powerful prose makes every show of affection beautiful and every trial of terror a horror. Between Shades of Gray is a real novel, based off real events, and for that very reason it should be compulsory reading. This is the very definition of a page-turner, filled with life in the terror of the darkness inflicted upon those who suffered these horrible things. What did you think about Between Shades of Gray? Hi Inidisar, I’m pleased to hear you loved it too – it’s such a wonderful book! It’s sad that you think books aren’t relevant to you – but I’m a firm believer that there’s a book (or several) out there for everyone! If you liked Between Shades of Gray I recommend you read Ruta’s other book, Out of the Easy which is as good if not better! Also, you could try Naked by Kevin Brooks. If you want maybe more personal recommendations you can always tweet or email me!